Welcome to Eva’s House! At our facility, we can cater up to 43 individuals comfortably. 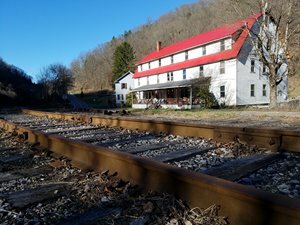 Some of our amenities include: complimentary breakfast (gravy, biscuits, bacon, sausage, and fresh eggs when available), TV, linens, fire pit, two large porches, plenty of parking, picnic shelter, machine spray off and much more! We offer efficiency suites that have their own private bathroom, as well as bunk style rooms with access to separate his and hers shower rooms just down the hall. Eva’s House is also pet friendly. We are only 20 minutes from the City of Welch which connects to the Pinnacle Creek, Indian Ridge and Pocahontas Trails. Once the Warrior Trail System opens, around Labor Day weekend, we will have direct access to that system! Call us today to make a reservation, we look forward to hearing from you!